Here they’ll find personalized recommendations of posts to see, people to know, and communities to join -- helping them stay in the loop on information being shared within your company. To make way for Discover, you may have noticed we removed the Collections tab. ‘Featured Collections’ have a new home within Discover and ‘Your / Followed Collections’ can be found by clicking on ‘Communities and Collections’ on your profile. Based on user feedback, we’ve also simplified tab navigation. With the addition of the Profile tab on mobile, it’s easier for people to reach their profile pages, where they can then quickly access their communities and collections. With this launch, we aim to make it easy for people to focus on what they’re interested in. 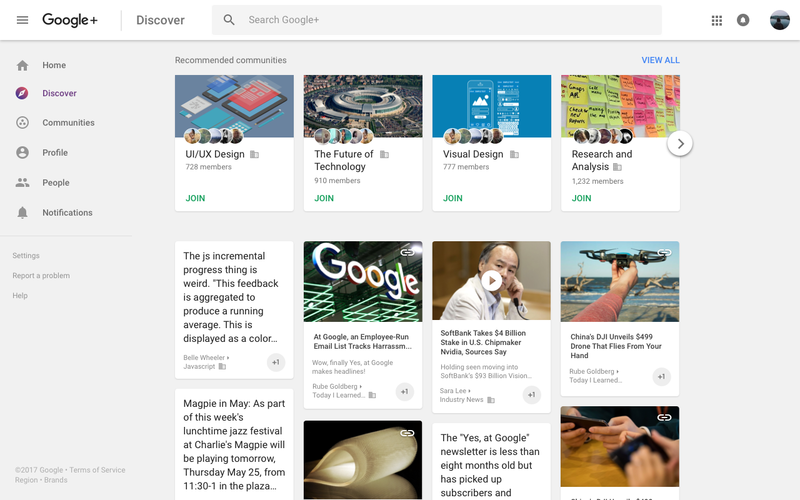 To help people using Google+ find the most relevant and useful conversations happening inside their companies, today we’re introducing a new Discover tab on iOS devices and the web.